Five of the bottom six in National Two South are still battling to stay in this division and on Saturday afternoon, the survival picture will become clearer as we enter the climax of a thrilling campaign. The standout fixture in Round 28 comes from Bristol as Old Redcliffians host Barnstaple at Scotland Lane. A place outside the relegation zone is at stake and with just four points separating the two sides, whoever comes out on top will take a huge leap towards safety. Meanwhile, rivals Wimbledon have given themselves a glimmer of hope as a win over Tonbridge Juddians last Saturday leaves them 12 points off safety with three matches remaining in the campaign. Truthfully, the Dons may well have to win all of their fixtures between now and the end of the month so a victory over already relegated Broadstreet this weekend is crucial. And are final stop comes at Hazlewood as London Irish Wild Geese host Clifton. Both of these sides have suffered contrasting fortunes over the last two months as the Wild Geese have slipped towards the trapdoor while four wins on the spin has left Clifton on the edge of safety. A win for either side will be vital. Elsewhere, Cinderford will be hoping to move one step closer to the National Two South title as they welcome Taunton Titans to Dockham Road. The Foresters require just eight points from their remaining three matches to secure automatic promotion to National One and the championship could be sealed this weekend if Chinnor don’t get a result. However, Matt Williams’ side have been superb lately and they clinched a top two spot last week so they will be keen to continue their good-form at home to Bury St Edmunds. Meanwhile, third placed Redingensians entertain Canterbury, Redruth go to Tonbridge Juddians and Henley Hawks take the trip to Worthing Raiders. It was labelled as their hardest remaining task in their journey to becoming National Two South champions, but last week, Cinderford managed to dispatch Redruth with minimal fuss as they took a huge step towards promotion to National One. Paul Morris’ men secured their 21st consecutive victory in a professional manner and with three games left to play, they are eight points clear at the summit. Of course, if second placed Chinnor slip up at home to Bury St Edmunds in Round 28 then the Foresters may clinch the title this weekend, but that is easier said than done especially with fourth placed Taunton Titans visiting Dockham Road. Tony Yapp’s side suffered a setback in their quest for a top three finish last week as they lost a thrilling contest against the aforementioned Chinnor in Somerset despite scoring seven tries. That result could sum up the Titans’ season as inconsistencies have hampered their shot at promotion once again, but they will want to complete another strong campaign on a high and to end Cinderford’s six month unbeaten record would be the ideal start. Chinnor secured a minimum of a play-off spot last week following their enthralling victory over Taunton Titans. Matt Williams’ side had to fight hard for the win, but after narrowly missing out on the top two 12 months ago, the Oxfordshire club now know they will have a shot at National One this time around. It is likely they will finish second barring a sensational collapse from Cinderford so for Chinnor, it may well be about building momentum for the rest of the month. The Black and Whites have certainly found their rhythm in recent weeks as they welcome Bury St Edmunds to Kingsey Road having won their last seven matches. In terms of Bury, they produced an excellent performance against third placed Redingensians last weekend as Jon Curry secured his first home win in charge of the Wolfpack. The Suffolk side come into this fixture on the back of consecutive wins which has lifted them up to sixth in the table. With Redruth 10 points ahead, a top six finish is the most likely for Bury and that would be a massive positive after a season of change at the GK IPA Haberden. Redingensians head coach Seb Reynolds was relatively satisfied with his team despite their defeat to Bury St Edmunds last weekend. The Rams handed a couple of new players their debut and they did fight back to earn two points which further consolidates the bronze medal position in National Two South. The Berkshire club are arguably the story of the season and with three matches to go, they sit three points clear of Taunton Titans. The Rams are unbeaten in their last three home matches and they welcome a Canterbury side to Old Bath Road this weekend who picked up a morale boosting win in Round 27. A superb 43-7 win over London Irish Wild Geese ended doubts surrounding a relegation battle for the City Men who currently sit ninth in the table. Andy Pratt’s side are five points off the top half and you would think a top eight finish would be their aim with a few weeks left in the season. Redruth travel to Tonbridge Juddians with the chance of securing a top five finish. If they pick up a bonus-point win in Kent and Bury St Edmunds fail to match the Reds’ result, then Pale Nonu’s side will not finish lower than fifth place for another season. The men from the Recreation Ground are limping to that achievement as they come into this fixture having lost three games on the spin against London Irish Wild Geese, Chinnor and Cinderford. With that in mind, Tonbridge Juddians may look to capitalise on Redruth’s poor form. It has been a superb season for TJs following promotion from the fifth tier last year and with three matches to go in this current campaign, they sit eighth in the table and on course for a top half finish. They welcome Redruth to the Slade having won three of their last five games and they have lost just once at home in 2018.
Henley Hawks’ wretched run of form continued last weekend as they fell to a narrow defeat against Clifton at Station Road. Pete Davies’ side were in the running for a top four finish a couple of months ago, but just one win in seven matches means they are now aiming for sixth place. In terms of the bigger picture, this has still been a season of progress for the Hawks who will now be desperate to end the campaign on a high. They visit Worthing Raiders who will be hosting their final home fixture of the season this weekend. The Raiders come into this match having won just one of their last five games and like Henley, they will be hoping to cap off one their most positive seasons for a couple of years in the right manner. Worthing currently lie 10th in the table, but can move to within a point of Henley with a bonus-point win on Saturday. The last few weeks couldn’t have gone much better for Clifton. In the middle of February, the Lavender and Blacks were teetering on the edge of the relegation zone, but four successive wins has nearly guaranteed their spot in National Two South for another season. Victories against Canterbury, Bury St Edmunds, Worthing Raiders and Henley Hawks leaves Darren Lloyd’s side 10 points clear of danger with three matches to go in the season. With fixtures against Redingensians and Chinnor to come in the final two weeks of the campaign, another win at London Irish Wild Geese this weekend could see them over the line. However, the hosts are desperate for the points themselves as a poor run of form has seen them slip towards the bottom three at the worst possible time. One win in five games for Lee Starling’s side leaves them just three points above the drop zone so a victory at Hazlewood on Saturday has to be imperative. London Irish Wild Geese may well have an eye on proceedings in Bristol this weekend as two of their rivals meet at Scotland Lane for a crucial fixture in the fight for survival. 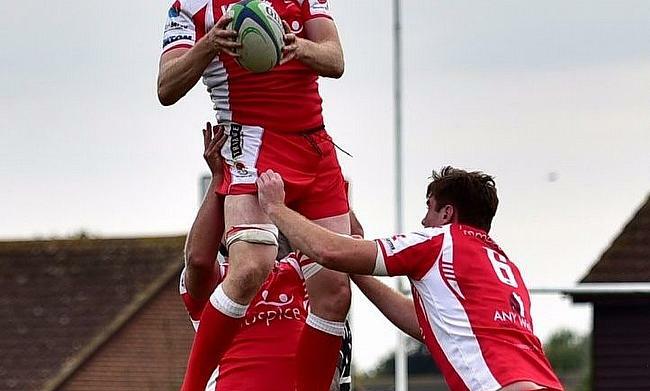 Barnstaple visit Old Redcliffians aiming to secure a second win on the spin to move themselves further away from the trapdoor. A narrow triumph over Broadstreet saw them move three points clear of the relegation places and with their hosts occupying the final spot in the drop zone, Barum can create some breathing space at this vital stage in the season. While Steve Perry’s side have struggled for form of late, Old Redcliffians have been picking up points on a regular basis which has given them a great chance of avoiding the drop. Three wins from their last five games has been key for Old Reds who know they cannot be relegated this weekend if they were to lose to Barnstaple. Saul Nelson’s side have showed great character to still be in with a shout of survival and a victory this weekend would lift them out of the bottom three. Wimbledon are still fighting. Victory over Tonbridge Juddians has given them the faintest hope of avoiding the drop and if they were do it, then it would be a remarkable escape from relegation. Three successive defeats looked like it could be end for the Dons after a wonderful revival following the turn of the year, but now they sit 12 points from safety still with a chance of staying up. The equation is simple for Wimbledon. Pick up two points or more this weekend and they could still be battling for safety heading into the final two games of the season, but if results don’t go their way, they will follow Broadstreet back to the fifth tier. The Midlands club had their fate sealed last Saturday when they were defeated by Barnstaple, but a win in front of their own supporters this weekend would put smiles back on Street faces after a very tough season which has seen them lose 22 matches.